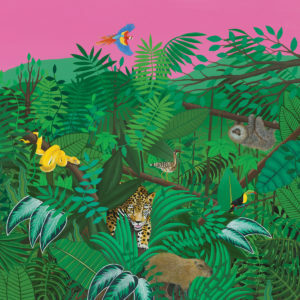 Last Tuesday the 14th, Turnover an Indie rock/ Dream pop band played in Toronto. Their show was held at The Mod Club and it was the perfect venue for them being all general assembly so people could move around and get together as most people did throughout the night. There were two opening acts starting the show, Pronoun and Elvis Depressedly. They both gave great performances opening up the show, they kept the good vibes up along with the energy. They played more mellow songs with a few hyped-up ones, but all with a lot of passion and memorable sounds. Then the headlining artist, Turnover came on the stage. This tour was for their recently released album “Good Nature” and they were playing to this by putting up a banner of the album cover and even bringing out a bright neon sign that said good nature which was so great and hilarious, it just added to their atmosphere. 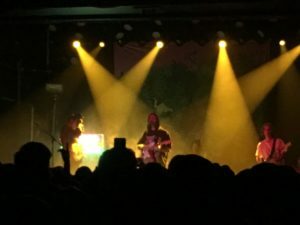 The performance by Turnover was above and beyond fantastic. Their characterizing sound of beautiful twinkling guitars and their steady groove rhythm translated perfectly live and sounded just as good as recorded. 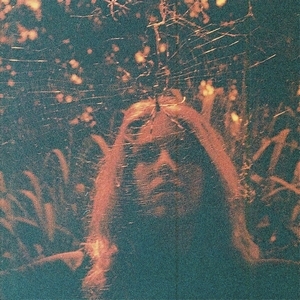 They divided the songs they performed in a pretty clever way, with the first part only playing and debuting songs form Good Nature and then switching it up to play songs from their phenomenal sophomore record “Peripheral Vision” which gained then a larger following, then a variety of their songs. Through the show Turnover was really humble about their experience, between songs talking of how it was a sold-out show and they were so glad, bringing up how one of their original opening acts Emma Ruth Rundle could not make it but we should still check her music out, and saying that this was their first time playing songs from Good Nature in Canada so that brought a little bit of nerves; yet that would not get to them as the performance they gave was not one to forget. 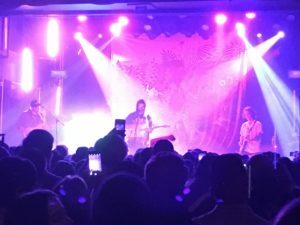 Throughout the whole night there was not a single song that Turnover played that didn’t have head bobbing or people moving, and the performances they brought sounded incredible with just enough movement by the band in to bring up the energy in the place. 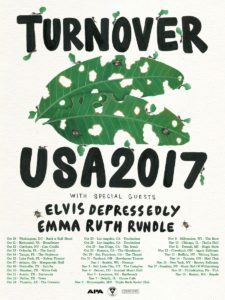 Whenever Turnover comes back to Canada, please do yourself a favour and see them because you not be disappointed.